It may be a new year but the TWD-ers are still working through Dorie Greenspan's Baking: From My Home to Yours! 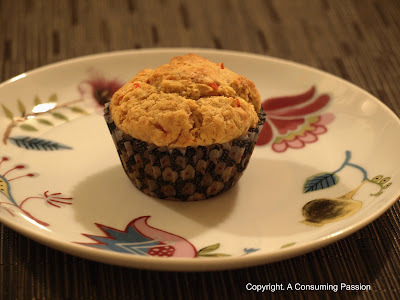 This week's pick was Savory Corn and Pepper Muffins. Now, having had a break for the holidays, which though extremely restful and nice, I was itching to return to my kitchen and my beloved baking equipment. In addition, I was dying to test out some new kitchen gear which I had received as Christmas presents (Thanks guys! You know who you are). Since I've only been back in London a week, I still haven't quite gotten my routine down yet, so today saw me rushing home from work to whip up this recipe and put up this post! Thankfully, being a muffin recipe, they were in the oven in no time. I have to admit, I'm not a huge fan of cornbread. I'm even a lesser fan of Mexican food and related flavours, so today's recipe wasn't really for me. Still, I'm glad I made these for it gave me a chance to use the brand new plates that I received as a belated wedding present from M's aunts and uncles. I'm glad you tried it. Hopefully the next recipe is up your alley. I hear you.. corn bread isn't my thing either although I love Mexican food. Your muffins look great! I love that plate! So pretty! I love cornbread...especially when it has a little kick to it. So I have a feeling I'd really love these! I stumbled upon your blog while in the middle of a major snack attack. This muffin looks sooooo good.